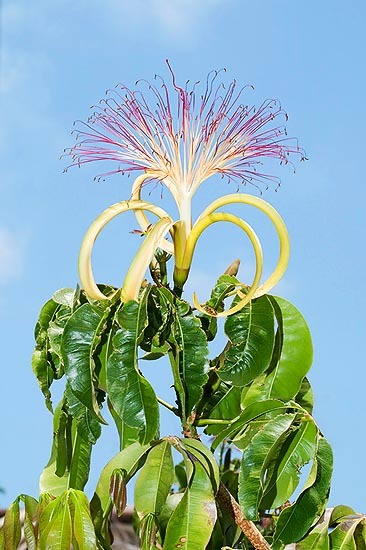 The Pachira aquatica Aubl. (1775) is native to tropical America (Bolivia, Belize, Brazil, Colombia, Costa Rica, Ecuador, El Salvador, French Guyana, Guatemala, Guyana, Honduras, Mexico, Nicaragua, Panama, Peru, Surinam and Venezuela), where it grows in the pluvial forests close to the margins of rivers, lakes and estuaries. The name of the genus is the one utilized in Guyana for the plants of the genus; the name of the species is the Latin word “aquatica” = aquatic, with reference to the marshy locations where it usually lives. Common names: Guiana chestnut “, “Malabar chestnut”, “money plant”, “money tree”, “provision tree”, “saba nut”, “water chestnut”, “wild cocoa” (English); “cacaoyer-rivière“, châtaigner sauvage”, noisetier de la Guyane”, “pachirier aquatique” (French); “castanheiro de Guiana”, “castanheiro de Maranhão”, “mamorana” (Portuguese); “apombo”, “cacao cimarrón”, “cacao de plaja”, “castaño de agua”, “castaño de la Guayana”; “ceibo de agua”, “ceibo de arroyo”, “chila blanca”, “pumpunjuche”, “quirihilo”, “sunzapote”, “zapote bobo”, “zapote de agua”, “zapotón” (Spanish); “Glückskastanie”, “Wilder Kakaobaum” (German). Evergreen, awnless, tree with trunk tall up to about 25 m, and a diameter of 30-90 cm, with thin bark remaining green for long time, then becoming greyish, slightly fissured along vertical lines; in the adult plants living in zones being periodically flooded, do develop, on the inferior part of the trunk, robust aerial roots which penetrate the soil forming real and proper buttresses which help in sustaining the plant. The leaves are palmate-compound, with 5-7 obovate or elliptic-lanceolate leaflets, long up to 28 cm and 3-14 cm broad, of a glossy pale green colour, coriaceous, with a slightly undulated entire margin. The flowers are hermaphrodite, terminal, solitary or in groups of 2-3 units, ephemeral, perfumed, with bent yellowish petals, long even 30 cm, 1,5 cm broad, with at the centre a crowd of stamina, red on the upper part, white on the lower one, 8-15 cm long, which assemble at the base in an 8 cm long column. The fruit is an ovoid, dehiscent (fruit spontaneously opening when ripe, along the lines of minor resistance, freeing the seeds) capsule, long 20-30 cm and with a diameter of about 12 cm, of dark-brown colour when ripe, containing 10-25 edible seeds, with a diameter of about 3 cm each. It reproduces by seed, which germinates in 8-10 days, in such case the fructification will take place by around the fifth year of age, and by cutting. Much ornamental plant, cultivated in tropical and humid subtropical climate countries, mainly for its luxuriant foliage, being the flowers fundamentally nocturnal and often hidden by the foliage, is fast-growing if placed in full sun, in presence of high ambient humidity and abundance of water; its cultivation can be tried in warm temperate climate zones, as it can stand, even if with loss of the foliage, temperatures around -2/-3°C. In pot, it is utilized for indoor decoration, appreciated also due to its robustness and facility of cultivation, placed preferably in very luminous locations, even if it resists rather well, also in partial shade. It is not particular to soil, provided well draining; watering are to be regular in summer, but without stagnations, and reduced in winter, keeping it at temperatures over the 14°C, best by 20-22°C, lower temperatures cause the yellowing and falling of the leaves and can generate deadly rottenness in connection with an excess of humidity in the substratum, in such situations it is better to stop watering, as it can stand, in spite of its origin, periods of drought without damage. Thanks to the particular shape of the trunk, slightly enlarged at the base, and its superficial roots, it is also a subject appreciated by the collectors of caudiciforms and for realizing bonsais. The fruits are picked up before their opening and the seeds can be consumed raw, roasted or fried; they contain, for more than the 50%, an odourless, white oil of good quality, which might be utilized for industrial purposes. The wood, white and tender, contains about the 35% of cellulose and is utilized in the fabrication of paper. In the roots and in the bark, they have found some substances with fungicide action which clearly hold a defensive function, seen the particular habitat where the plant lives when in the wild. Synonyms: Sophia carolina L. (1775); Carolinea princeps L. f. (1781); Pachira grandiflora Tussac (1827); Bombax insigne Wall. (1830); Carolinea macrocarpa Schltdl. & Cham. (1831); Pachira macrocarpa (Schltdl. & Cham.) Walp. (1842); Pachira longiflora (Mart. & Zucc.) Decne. (1880); Pachira aquatica var. surinamensis Decne. (1880); Pachira spruceana Decne. (1880); Bombax aquaticum (Aubl.) K. Schum. (1890); Bombax macrocarpum (Schltdl. & Cham.) K. Schum. (1895); Pachira pustulifera Pittier (1914); Pachira villosula Pittier (1914); Bombax rigidifolium Ducke (1925); Pachira aquatica var. occidentalis Cuatrec. (1954).